Urban Acreage: Easy DIY: Make Your Own Pom Poms! Easy DIY: Make Your Own Pom Poms! As promised, here is a tutorial on how to make large pom poms! I'm sorry it's later than planned. I spent last weekend prepping for a job interview, which isn't nearly as much fun as making pom poms, spray painting junk, etc. But, I love my job and it pays for the blog so, yeah - gotta do what ya gotta do! Using a fork to make pom poms is nothing new, but I wanted to mix it up by using an oversized fork to make big pom poms. I also had a strange urge to try my hand at making a GIF, which appears later in the post. 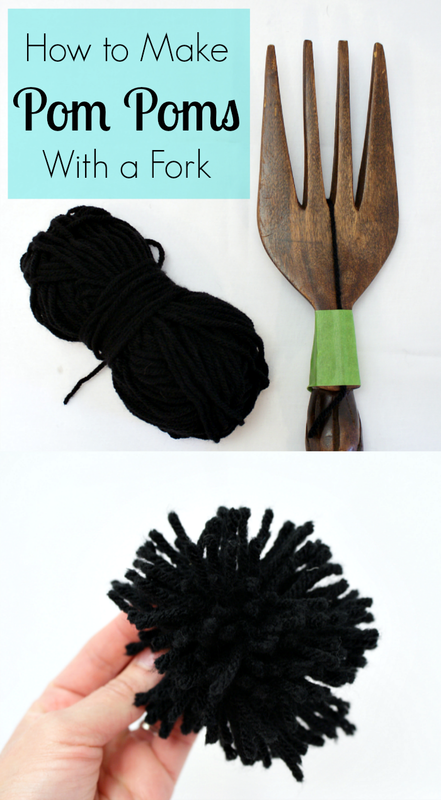 The first thing you'll need to do is buy a pom pom maker - a large wooden fork. The thrift store by our house had a whole box of them for a dollar or two a piece. The next thing you'll need to do is keep it away from sticky fingered munchkins! Apparently giant wooden forks are very appealing to three year old kids. Whenever I wasn't looking, B would swipe the fork and I'd run after him shouting "Hey! Come back here with my pom pom maker!" 1. Loop a six to ten inch piece of yarn through the middle and secure it with painter's tape. 2. Run the yarn in front of the first two fork tines, then below the second two. 3. Weave the yarn back and fourth over and under until you've reached the top. The trick to a full and fluffy pom pom is to weave it tightly and also go back and forth over the yarn a few times so that it's layered as you go up the fork. 4. Once you've reached the top, remove the tape and tie the long piece at the top. 5. Slowly move the yarn loops up and off the fork, tightening the string as you go. 6. When the pom pom is removed and the center piece tightened, you'll have a nice loopy pom pom. 7. Cut the loops and do a little trimming to make it uniformly round. That's it! A simple and inexpensive way to make pom poms for whatever you need! Just for funsies, here is a GIF of the process! Pom poms were a nice finishing touch for an accent pillow in our office. I did a tutorial for the half moon pillow a couple weeks back and plan to do a post about the blue and white pillow next!